Fed up with Ryanair's restrictive baggage allowance? Missing the enjoyment of air travel? Why not treat yourself to a luggage-free journey by shipping your luggage ahead with Send My Bag? Have your luggage picked up from home before you leave and find it waiting for you at your hotel when you arrive at your destination. Or, if you are moving abroad to a new house, have your luggage arrive once you are there to receive it and create a new home with all your favourite possessions. Discover how cost-effective it is to send your luggage with Send My Bag. One personal item, 40 x 20 x 25 cm, free of charge. 'Priority & 2 Cabin Bags' or 'Plus' customers may also bring on board a larger item measuring no more than 55 x 40 x 20 cm and weighing 10 kg or under. Priority costs £8 per person, one way. Non-Priority customers may check their 10 kg hand luggage into the hold for £10 per person, one way. If travelling with an infant (23 months and under) seated on your lap, you may also bring into the cabin a baby bag up to 5 kg in weight. There is no additional cabin baggage allowance for the infant. You may also bring a pushchair to the steps of the plane, at which point it will be loaded onto the plane. Infants over the age of one sitting in their own seat receive a free baggage allowance of 10 kg, plus one smaller item. As part of Ryanair’s carry-on luggage allowance you are permitted to carry a small musical instrument, such as a cello, guitar or violin, on board if you purchase an extra seat for the item. You must enter 'item seat' as surname when booking the extra seat, and 'extra' as the first name. Passengers can purchase 'Priority & 2 Cabin Bags' in order to keep their large item of hand luggage on board the plane with them. This means they don't have to either check their larger cabin bag into the hold for £10 or travel with a small personal item only. By keeping their larger bag with them, such passengers won't have to wait at the baggage carousel to retrieve their item at the end of the journey. 'Priority & 2 Cabin Bags' costs £8 per person, one way. what if my Cabin bag is overweight/ oversized? If an item of cabin luggage exceeds the dimensions or weight permitted by Ryanair’s baggage allowance, it will be placed in the hold and a charge of £50/€50 (plus VAT) will be levied. Non-Priority customers with an oversized free small bag will be required to pay £25/€25 at the gate to have their bag checked into the hold. Ryanair allows passengers to pack toiletries and make up into their hand luggage provided all liquids are in containers of no more than 100 ml. In addition, all liquids must be within one transparent, re-sealable plastic bag with dimensions of no more than 20 cm x 20 cm. Compare Ryanair's hand luggage allowance to that of other airlines. Ryanair checked baggage allowance: Passengers may pay to check up to three 20 kg bags. This costs £25/€25 per bag, £35/€35 during peak periods, or £40/€40 at the airport. If a bag exceeds the pre-booked checked baggage allowance, excess baggage fees will be charged at £11/€11 per kilo. No single checked bag may exceed 32 kg in weight or dimensions of 81 x 119 x 119 cm. Passengers may also check a small 10 kg suitcase into the hold for £10 if booking online, or £20 at the airport desk. Its dimensions must not exceed 55 x 40 x 20 cm. Ryanair’s baggage allowance permits one fully collapsible pushchair per child, plus one of the following items to be carried free of charge: car seat/booster seat /travel cot. Sporting equipment, such as snowboards, skis, golf clubs or bikes, and large musical instruments may be checked into the hold in addition to other checked baggage, as long as each item does not exceed 20 kg (or 30 kg for bikes). Prices vary according to item. The fee for a ‘large sports item’, for example, is £55/€55, one way, or £65/€65 if paid via the telephone or at the airport. Bikes cost £60/€60 online or £75/€75 at the airport/ by telephone. Ryanair increases the cost of Priority Boarding by £2 from £6 to £8. In addition, customers choosing to pre-pay for a 10 kg checked bag must now pay £10, rather than £8. Now the only free hand luggage allowed on board Ryanair flights is one small personal item; 40 x 25 x 20 cm. A new report has revealed that Ryanair has earned over £1.7 billion in just one year from ancillary revenue, placing the airline among the top 5 airlines for this type of income. Unlike other airlines in the top 5, Ryanair makes this money from add-ons only (such as charging to print boarding passes), whereas other airlines count their frequent flyer programmes among their ancillary revenue streams. Italy's competition watchdog, Antittrust, is investigating Ryanair's new hand luggage fees. The watchdog dislikes the fact that customers must pay €6 (£5) in order to bring a small suitcase on board as hand luggage. They suggest that hand luggage should be included in the overall ticket price, and not made available as an optional extra only. The watchdog argues that Ryanair is guilty of unfair commercial practice. From 1st November, 2018 Ryanair passengers will have to pay £8 to check a small 10 kg suitcase into the hold or £6 for Priority Boarding, which allows them to bring their suitcase on board. At present such suitcases may be placed into the hold at the gate, free of charge. This means passengers will only be able to bring one smaller carry-on item as far as the gate, free of charge. Ryanair are offering Black Friday deals on flights, with some going for as little as £9.99. These flights are to be taken in December this year, but there are likely to be more deals popping up in the next few days. Why not grab one of these deals and avoid Ryanair's baggage fees by shipping your luggage to your destination with Send My Bag? The new Ryanair cabin baggage policy, which states that any passengers without Priority Boarding will have their larger item of hand luggage placed in the hold, has now been postponed until 15th January, 2018 to allow passengers to get used to the idea. Following the disruption caused by Ryanair incorrectly scheduling staff holidays, the airline has now announced that it is suspending 34 routes over the winter period, including Newcastle to Faro and London Stansted to Edinburgh and Glasgow. Passengers will have to find alternative modes of transport on the 34 routes affected, looking to more expensive airlines or slower transport options such as bus and train. Although Ryanair has offered limited compensation to those passengers affected by its cancelled flights, holidaymakers are unlikely to be reimbursed for any other aspects of their holiday they have missed out on. This is because most basic holiday insurance packages do not cover loss as a result of cancelled flights. Ryanair has cancelled approximately 2000 flights, leaving 315,000 passengers either stranded abroad, stuck at home and missing their holidays, or forking out hundreds of pounds to make other arrangements. This is a result of a blunder over the scheduling of pilot holidays. The knock-on effect of this scheduling error is likely to be enormous, especially for passengers among the 50 million people every year who choose to travel on self-connected flights. At the best of times these passengers have to do all the leg-work themselves when it comes to checking, reclaiming and rechecking their baggage onto different flights. If their Ryanair flights are cancelled, they will encounter all manner of difficulty trying to reorganise their itineraries, and all with a pile of baggage in tow. 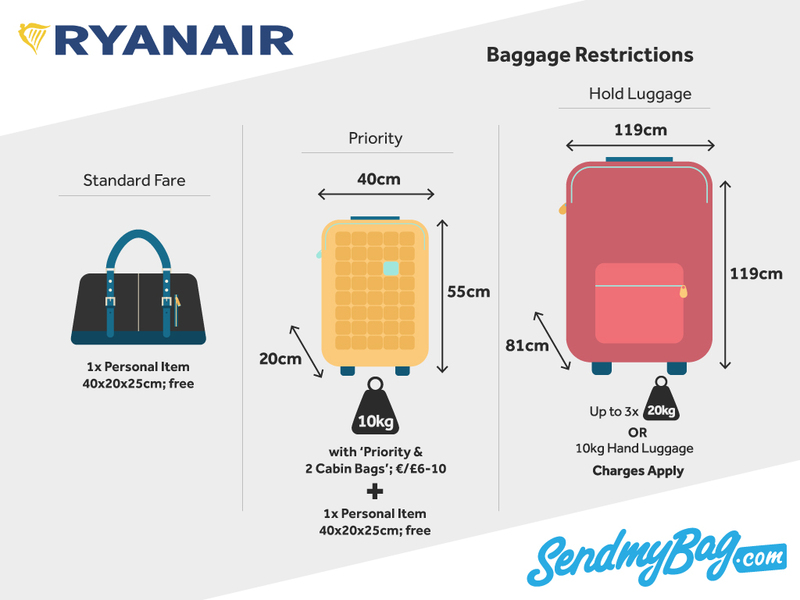 New Ryanair baggage rules mean that, unless passengers pay £5 for Priority Boarding, they will be forced to place their larger item of cabin baggage into the hold once they arrive at the boarding gate. This means that non-Priority customers will only be able to bring their small personal item on board with them. This is likely to cause problems for passengers who are unaware of the new policy and who have not prepared their hand baggage for the stresses and strains of being loaded into and out of the hold. Damaged hand luggage will likely become a common occurance on Ryanair flights. There is now all the more reason to send your luggage to your destination and avoid altogether the hassle of flying with luggage. Looking for Ryanair sized hand luggage?